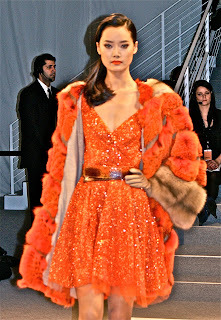 Having known Dennis Basso for a long time – I worked for him when he was a young, hungry fur designer, just starting out; way long before he became a designer to the rich and famous, with a ritzy Madison Avenue boutique, and big fame and bigger money, generated from the sales of his faux fur garments and more recently, his ready-to-wear, often seen one of the most well-known Home Shopping Television Networks. Following Basso’s career as I have through the years, I am always surprised by what he seems to have up his sleeve for each new collection, not only because he seems to come up with exciting furs and clothing season after season, but also because of how he makes his “ladies who lunch” swoon each and every time a new piece hits the catwalk. Plus, there is always Basso’s ongoing love affair with editors – from the venerable, super-glossy magazines to new websites, blogs and the like – that has kept him top of mind, since his days as fur designer for the House of Ben Kahn. Truth be told, Basso always was, and always will be, a showman. Never one to be shy and retiring, his big personality; in stature, voice and design sensibility, makes who he is and what he does, something quite special. For Fall, Winter 2012, Basso takes a ride on The Orient Express, as he conjures up visions of grand travel, luxury, mysterious destinations, fabulous women, swathed in furs, beautiful clothing and opulent jewels. The color palette for the furs and clothing includes taupe, de rigeuer black, gray, white, navy, and a not-seen-before shade of opal, along with the introduction of a strong shade of Cayenne as a strong accent color. Basso always treats his furs as important, but there is that special twist of a light, airy, playful feeling; cashmere linings, oversized hoods, toggle closures, for example. Russian Sable, Broadtail, Ermine, Lynx, Chinchilla and Fox stand on their own, or designed in more unexpected combinations. Broadtail trench coats are seen trapunto-stitched or backed with cashmere, to create a more luxurious, double-face look. Either as a companion to the outre aura of the furs, or worn solo, hand-beaded evening gowns sparkle plenty with Swarovski crystal accents and glass beading. Silhouettes embrace the body by way of wrapped waistlines, trapeze shapes and fitted sheaths; many of which are seen embroidered for cocktail time, or done up in cashmere for day. Richest fabrics, such as gazar, silk-satin, georgette and organza, move and flow with the wearer. Basso Hits All the Furry Notes!